September 1987. In the nine months since The Trial of a Time Lord, the Conservative Party won the 1987 UK General Election. But while Margaret Thatcher is back, Colin Baker is gone – sacked by the BBC as a very public way of disowning the programme and its direction. 10 years after Philip Hinchcliffe was dismissed for making Doctor Who too violent, the show is once again in crisis mode. For the third time in a decade, it’s all change. Given that no-one’s really known what to do with Doctor Who since 1977, it’s a miracle that the show has staggered on for so long without any obvious affection or support from within the BBC. No wonder BBC management tried to quietly kill it in 1985. Their failure to carry through with that decision and the brouhaha over Season 23 seem to have wiped out any lingering goodwill for the programme. Reading Richard Marson’s recent biography of John Nathan-Turner it’s obvious that BBC1’s controller Jonathan Powell would have liked nothing more than for Doctor Who to just have vanished entirely. But the BBC has always been a cautious organisation, and to wield the knife again so soon after the previous furore was unthinkable. So we get to Time and the Rani – a story practically no-one at the BBC wanted to make (including the new script editor Andrew Cartmel, and Colin Baker – who refused to take part in a handover). 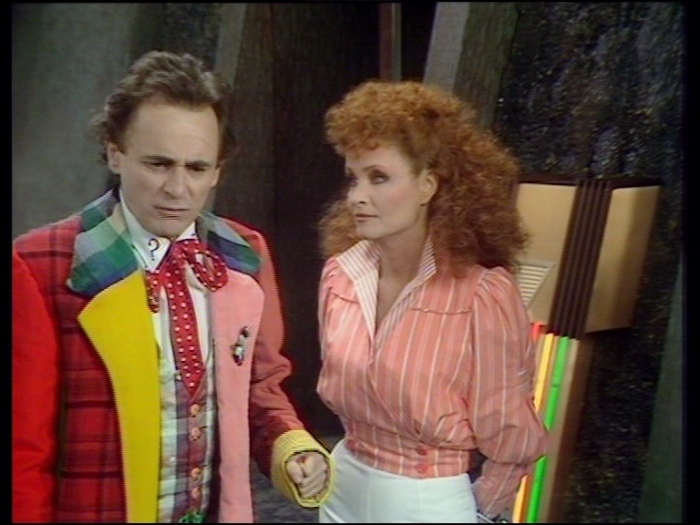 Even the writers, who put this together as a swansong for the sixth Doctor, weren’t overly keen on reworking it for Sylvester McCoy and by all accounts found it an unhappy experience. This is probably the least-loved Doctor Who story, both in front of and behind the scenes. But here it is, the runt of the litter. What is there to say about a story that languishes in 198th place on Doctor Who Magazine’s poll of the first 200 stories? Well, for a start, this was meant to be a rescue job for the sixth Doctor – the story that redeemed his character, and showed him at his best before he shuffled off this mortal coil. Time and the Rani shows a melancholy Doctor regretful of his past, showing concern for his companion and compassion for the Rani’s victims. He apologises to the Rani (whom he thinks is Mel) for being short with her, and mourns the deaths of Sarn, and even a Tetrap. He pauses to express his sorrow at Sarn’s “sad skeleton”, and, at the end, would presumably have sacrificed himself to destroy the giant brain and save Lakertya. Thought it’s an incredibly lightweight story, it’s the right end for the sixth Doctor: not wiped out at the end of another massacre, but bravely preventing one, and saving the universe to boot. And because Time and the Rani was clearly conceived as a story to fix the sixth Doctor, that this became the seventh Doctor’s first story is fortuitous. So many of the qualities McCoy brings to the role – a wistfulness, and a concern for the small things in life – are here in the mix. By getting the character of the Doctor right for the first time since, well, The Mark of the Rani, Pip and Jane Baker make sure this new Doctor sets off on the right foot. And although McCoy overplays some scenes, and has an early tendency to swallow some of his lines, he plays the Doctor’s introspection and melancholy very impressively indeed. The other interesting thing about this is that from the second he wakes up, the new Doctor is planning to get things done: a temporal flicker in Sector 13 needs investigating, and something’s up on Centauri VII. The sixth Doctor was meant to be the proactive incarnation, sorting things out where the fifth Doctor prevaricated. As we’ve seen, that never really worked out. But the seventh Doctor seems to be conceived along the same lines, always planning, always thinking a few moves ahead. This is going to become one of the defining characteristics of this incarnation: his forward planning. No longer an aimless wanderer in the fourth dimension, but a fixer, deliberately going to Paradise Towers, Terra Alpha and Victorian Perivale to investigate and resolve strange goings on. Then there’s the look of the thing: after The Leisure Hive, Time and the Rani is Nathan-Turner’s second chance to radically overhaul the series. There’s the first significant change to the opening titles since 1980, plus Keff McCullloch’s new arrangement of the theme tune. Andrew Morgan’s direction is quietly impressive – less showy than Lovett Bickford’s, but with an equal emphasis on revealing the monsters through brief glimpses of details: a claw or a foot stamping into shot. Computer graphics – including the TARDIS crash landing and the Rani’s death bubbles – appear for the first time, so this looked as visually fresh in 1987 as The Leisure Hive did in 1980. That’s more than lipstick on a pig – Time and the Rani is by no means a great story, but its problems aren’t fundamental issues about the role of violence, the objectification and abuse of Peri, or the character of the Doctor. In trying to write out Colin Baker in a story where he gets to be Doctorish and heroic, the Bakers by default introduce Sylvester McCoy with those same characteristics. This is by far the weakest seventh Doctor story, but that’s only because the next three years are going to see a renaissance in the quality and ambition of the show. There’s a steady upwards trajectory across the McCoy era, and it begins in Time and the Rani. If this had been Colin Baker’s last serial, it would barely have made it into the bottom half of his episodes. Plus, a story that has Kate O’Mara doing a Bonnie Langford impression can be forgiven practically anything. Time and the Rani is a story about a planet that has fallen for many years into self-indulgence and indolence, battered by enemies within and without, but finally shaking off its torpor and taking control of its own destiny. If that isn’t a metaphor for Doctor Who in 1987, I’m not sure what is. Next Time: “Your voice is different, and yet its arrogance is unchanged. Welcome to my new Empire, Doctor.” War on Earth in Remembrance of the Daleks.